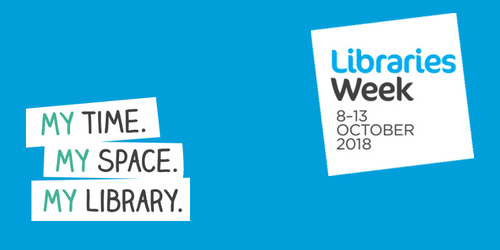 It's #LibrariesWeek, where we celebrate our nation's libraries. If you're new to the UK, or planning to move here soon, here are some of the most amazing libraries that we have to offer! This week marks the time of the year where we celebrate our nation’s libraries. 2018 has a specific focus on wellbeing and mental health. Highlighting the role that libraries play in providing a safe space for revision, self-education, and a place to make new friends. 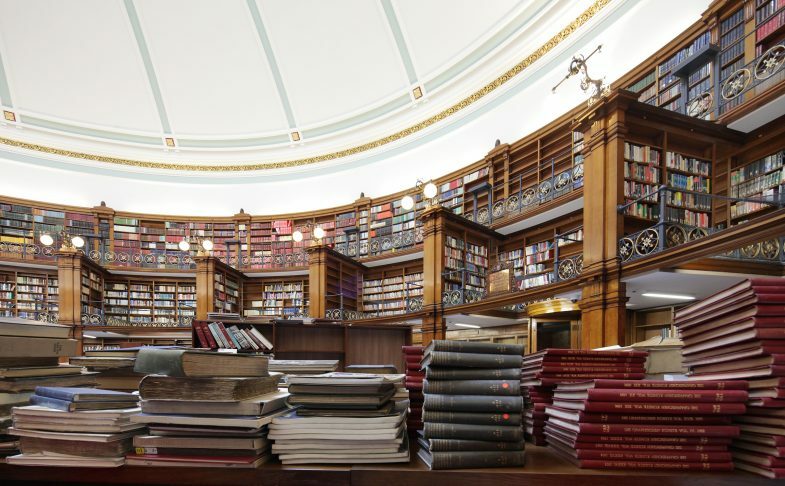 We’re going to provide you with a guide to the greatest libraries in the UK, that you must visit while you are here. 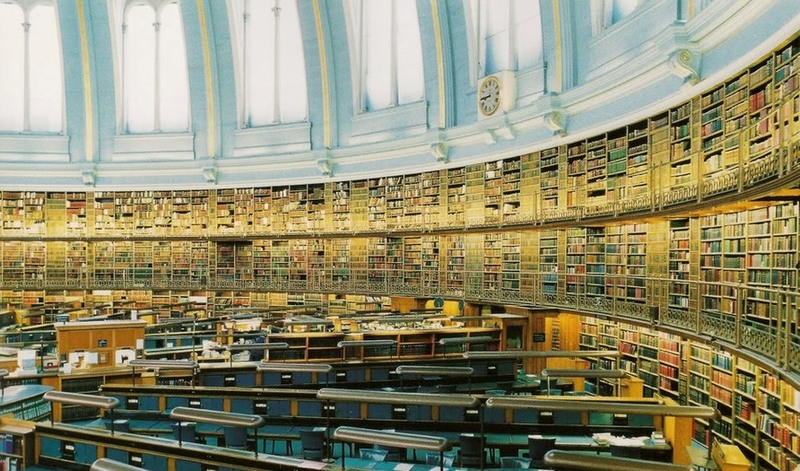 Whether you’re a bibliophile, bookworm, or just appreciate good history and architecture, these libraries will not disappoint! The British Library in London is the largest national library in the world with over 200 million items (14million of which are books). It is a legal deposit library, which means it is entitled to receive a copy of every single book produced in the UK and Ireland. It has 625km of shelves and this grows by 12km every year. Listed as a “Grade 1 building of exceptional interest" for its architecture and history, this is a place you absolutely must visit during your stay in London. But I hope you are here for a while because it is said that if you were to view five items a day, it’d take you 80,000 years to see everything! 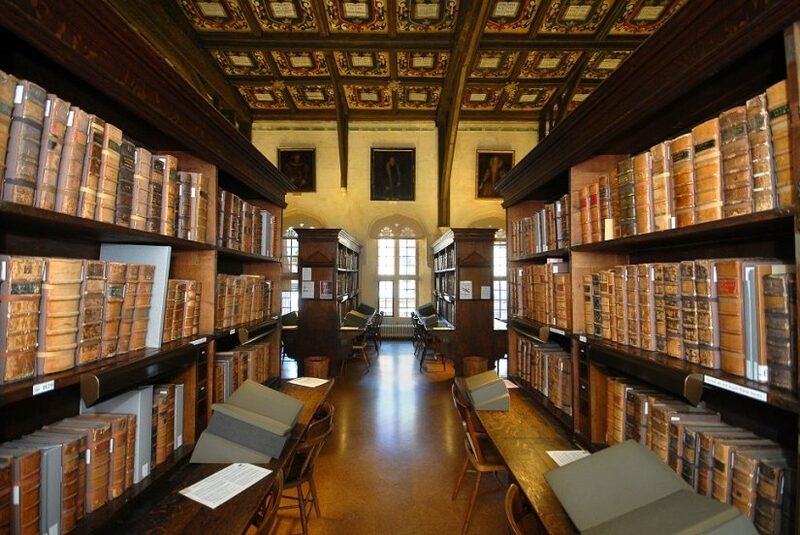 The main research library of the University of Oxford and one of the oldest libraries in Europe. It began in the 14th century under the will of the Bishop of Worcester. After 1488, the university stopped spending money on the upkeep, and the library fell into decline. In 1598 the library made a comeback, shortly after the purge of “superstitious” Catholic-related manuscripts, when Sir Thomas Bodley wrote to the Vice Chancellor of the University offering to support the development of the library. By 1620, Bodleian had amassed a collection of over 16,00 items and anyone who wanted to use the library was required to buy a copy of the 1620 library catalogue for a price of 2 shillings and 8 pence. In 1889, Enriqueta Rylands purchased a site on Deansgate to open a library in memory to her late husband, John Rylands. The library opened to the public in 1900. 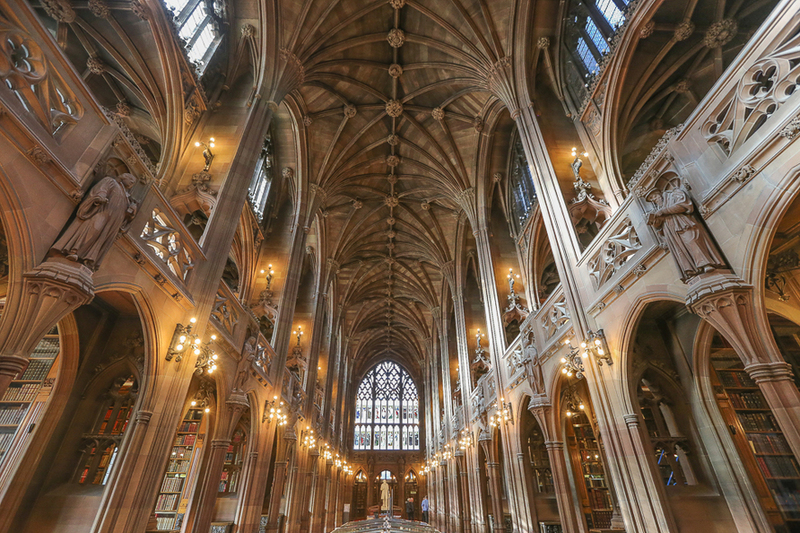 Designed by architect, Basil Champneys, the library is a great example of Victorian Gothic architecture. In 1972 it became part of the University of Manchester. Over the years the added collections caused a need for expansion. It was expanded four times, most recently being in 2007. When the library opened its doors it had 70,000 books and less than 100 manuscripts; by 2012, more than 250,000 books and over one million manuscripts. This library is a great place for tourists and history buffs, with some amazing architecture including the reading room, and toilets which have been unchanged (but regularly cleaned) since 1900! 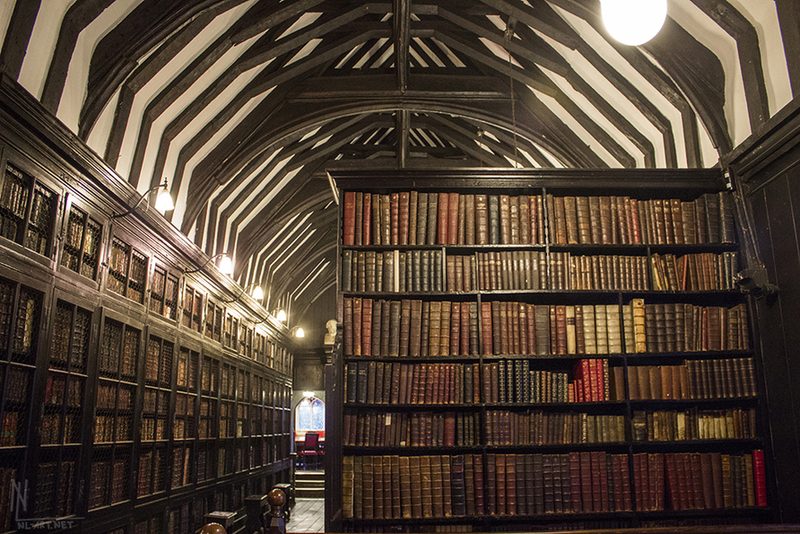 The oldest library in the English-speaking world. Founded in 1653 by a Manchunian textile merchant, banker and landowner, Humphrey Chetham. The building itself was built in 1421 to accommodate a college of priests. This remains one of the most complete medieval complexes to survive. The founding fathers of communism, Karl Max and Frederich Engels visited to the library during Marx's visits to Manchester, in the summer of 1845. The research, whilst sat at the four-sided desk in the alcove Reading Room, conducted during these visits ultimately lead to The Communist Manifesto. The library often acts a shrine for communist pilgrims and anyone interest in Medieval Britain. The Maughan Library, now the main research library for the Kings College London University, was constructed in 1851, but dates back to the 13th century. In 1232, the site of the Dormos Conversorum was established by King Henry III to provide a place to live and worship for Jews that had converted to Christianity. 1290 brought the expulsion of Jews from England by King Edward I, and the building was used to house records. In 1617 the chapel was rebuilt by Inigo Jones and in 1838 the Public Record Office Act was passed and to keep public records safe. They used the central wing in the building to hold these records. Interestingly, it is claimed to be the first ever purpose-built fireproof buildings in England. The storerooms were designed as compartmentalised closed cells, in order to eliminate the risk of a fire spreading. One of the cells is still in its original condition. 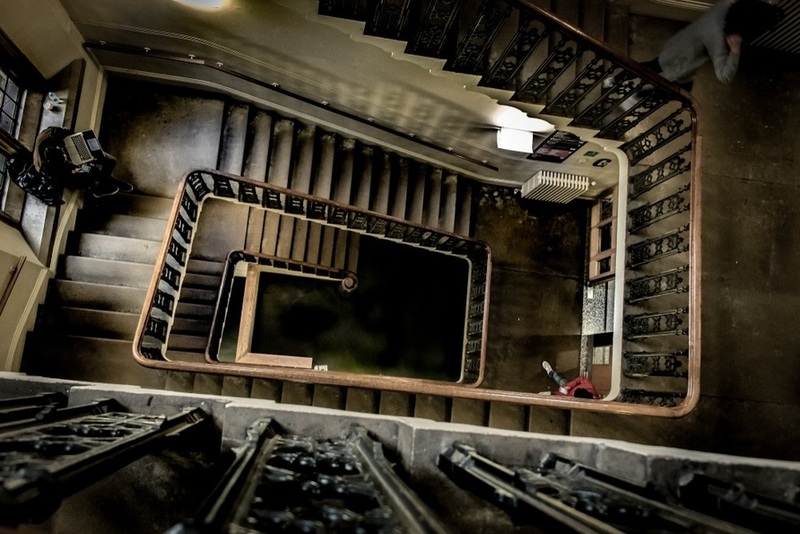 In 2001 King’s College London acquired the building and set about a two-year renovation at the cost of £35m. During the works, they discovered two rare painted zinc ceilings from the 1860s. In the library, you will discover the Foyle Special Collections Library, which houses 170,000 printed works from the 15th century to the present day. This includes Britain’s 1812 declaration of war on the US. 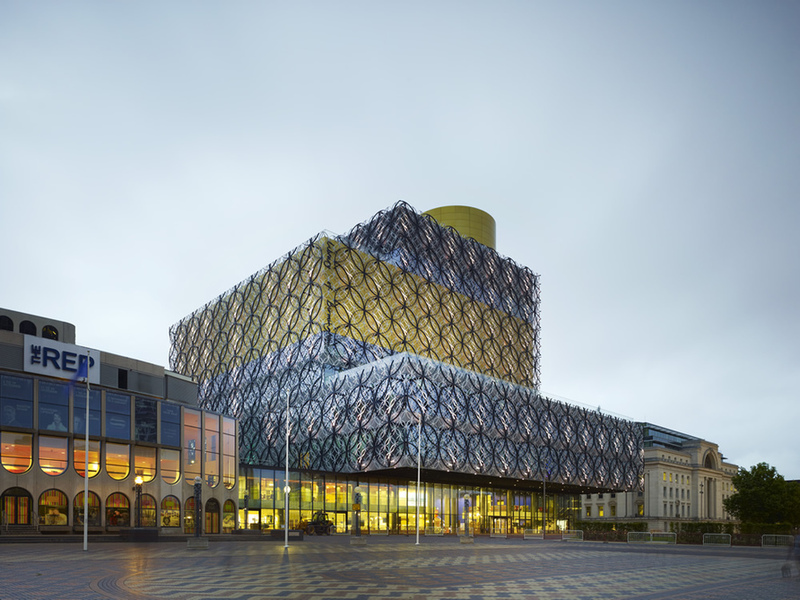 The Birmingham library is a great example of contemparary architecture and a must visit for any fans of such work. The library was voted the biggest tourist attraction outside of London. Mostly due to its extraordinary appearance and the fact that it is the largest regional library in Europe. It was opened in 2013, by Nobel Peace Prize laureate Malala Yousafzai, as a flagship project for the city’s redevelopment, it certainly does it’s job by making itself a prominent figure in the Birmingham skyline. Insid, you’ll find the Shakespeare Memorial Room, Britain’s most important Shakespeare collection. This collection holds 43,000 books, including a copy of the First Folio (1623). The room was designed in 1882, but when the building was demolished in 1974, it was dismantled and rehoused within the walls of the Birmingham Library. The Liverpool Central Library is located within several historic buildings on William Brown Street, Liverpool. The first of which was built in 1860. A major rebuilding of the library was announced in 2008 and reopened in 2013 which introduced a great mix between the existing historical parts of the building and a more modern design. The library has a very large collection of records which include: Hospital records, family papers dating back to the 13th century, Jewish community archives from the 18th century, and Newspapers dating back to 1756. One of the main attractions is a copy of the book “Birds of America” which was published as a series of collections between 1827 – 1837. The book was created by naturalist and painter John James Audubon and is said to one of the most significant natural history books in the world. Queen Elizabeth I, in 1582, investigated the cathedral and found that the collection, gathered since the 12th century, was poorly organised and poorly kept. The whole library was moved and in 1611 the Chained Library was opened by a clergyman, Thomas Thornton. The town of Hereford fought off invaders from Denmark in 914, but a war with the Welsh saw the town plundered and set ablaze in 1055. The books in the current collection date back to around 1100. The oldest volume in the library, Hereford Gospels, dates back to around 780 AD and is the only book to survive the 1055 fire. 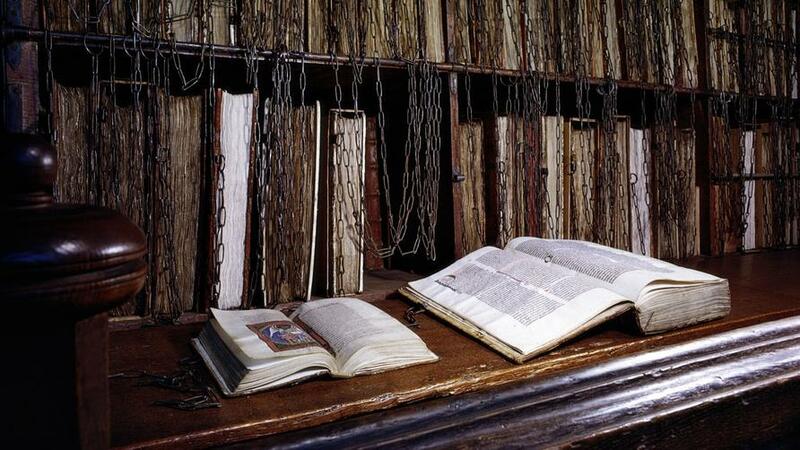 Well known for its chained books as it is the only library of this type to survive with all of the chains and rods and locks still intact, this library is a must-visit! Our bespoke settling-in packs will show you the closest library to your new home.